The move came as Egypt’s Supreme Council of Universities formed a committee to establish an ‘Arab higher education area’ (AHEA), according to the World University News Service, which gives as its source a report published by the Sada el-Balad Arabic news website. AHEA envisions the setting-up of joint certificates for masters degrees and doctorates issued by participating Arab universities, and a joint ‘electronic higher education system’ through which higher education will ultimately evolve into a mix of traditional learning inside universities and up to three quarters of degree course content delivered via e-communications. The AHEA initiative follows Alexandria University’s July agreements with the Charitable Lebanese University and the Malaysian Falcon Company to open campuses in those countries. There is already a branch of Alexandria University in Tong City in newly independent South Sudan, while Cairo University has a branch in the Sudanese capital, Khartoum, with facilities in four Sudanese states. 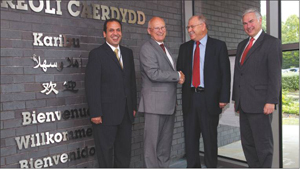 To address the ‘leadership challenges’ presented by such ambitious plans, three Egyptian universities, together with three universities from Morocco and two each from Lebanon and Tunisia, launched Arelen, which is to be jointly hosted by the Association of Arab Universities (AarU) – based in Jordon and with 240 member institutions – and Cardiff Metropolitan University in the UK. Cardiff Met dean of international development Mohamed Loutfi, who is coordinator for Arelen, said the network would assist in training current and new leaders on guiding higher education institutions. Arelen will also receive advice from the UK-based Leadership Foundation for Higher Education, which advised on the reform of higher education institutions in Iraq. Magna Charta Observatory, which had a guiding role in the Bologna Process, is also on board. Egypt, Lebanon, Tunisia and Morocco will each set up their own Arelen Leadership Centre delivering management modules, some via online distance learning. A masters degree in university management is to be developed. Another priority of Arelen will be the Women in Higher Education Elite Leadership project, which aims to promotes the role of women leaders in Arab universities. Funding for Arelen comes from the EU’s Tempus programme for the ‘modernisation of higher education’. One of the few programmes (along with Erasmus Mundus) that allows participating organisations within EU countries to run projects with partners outside the EU, Tempus (http://tempus.uwic.ac.uk) is administered by the EU’s Education, Audiovisual and Culture Executive Agency.